The Bat-Signal is a distress signal device appearing in American comic books published by DC Comics, as a means to summon the superhero, Batman. It is a specially modified searchlight with a stylized emblem of a bat affixed to the light, allowing it to project a large bat symbol onto the skies over Gotham City. The signal is used by the Gotham City Police Department as a method of contacting and summoning Batman in the event his help is needed and as a weapon of psychological intimidation to the numerous criminals of Gotham City. It doubles as the primary logo for the Batman series of comic books, TV shows and movies. Batman (or The Batman) is a 1943 black-and-white 15-chapter theatrical serial from Columbia Pictures, produced by Rudolph C. Flothow, directed by Lambert Hillyer, that stars Lewis Wilson as Batman and Douglas Croft as his sidekick Robin. The serial is based on the DC Comics character Batman, who first appeared in Detective Comics #27 in May 1939. The villain is an original character named Dr. Daka, a secret agent of the Japanese Imperial government, played by J. Carrol Naish. Rounding out the cast are Shirley Patterson as Linda Page, Bruce Wayne's love interest, and William Austin as Alfred, the Wayne Manor butler. The serial's storyline involves the Batman, a secret U. S. government agent, attempting to defeat the sabotage schemes of Japanese agent Dr. Daka operating in Gotham City at the height of World War II. Serving Daka are his traitorous American henchmen. Batman is notable for being the first appearance on film of Batman and for debuting serial story details that quickly became permanent parts of the Batman comic's mythos: the Bat's Cave and its secret entrance through a grandfather clock inside Wayne Manor. The serial also changed the course of how Alfred Pennyworth's physical appearance was depicted in Batman stories. At the time Batman was released in theaters, Alfred was a portly gentleman in the comics. Subsequent issues suddenly portrayed Alfred as trim and sporting a thin mustache, following actor William Austin's portrayal. 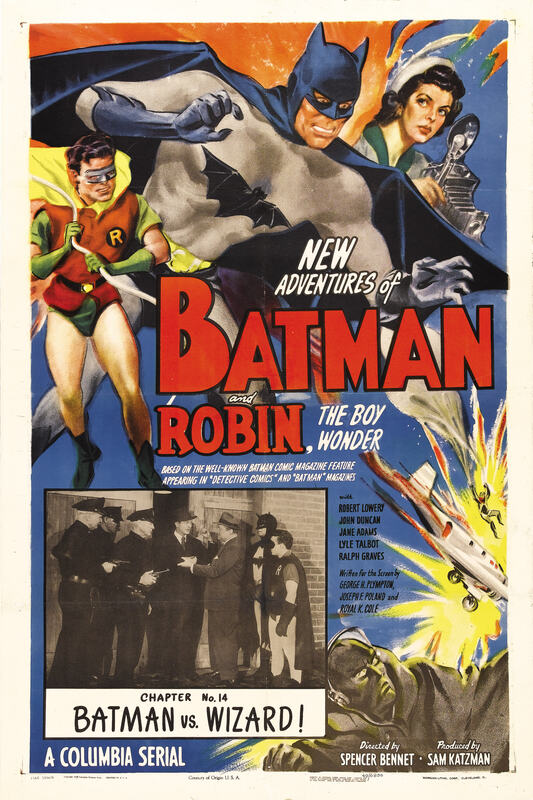 The serial was commercially successful and in 1949, four years after World War II, spawned another Columbia chapter serial, Batman and Robin. The entire first Batman serial was re-released theatrically in 1965 as An Evening with Batman and Robin, and proved very popular. (Some theatres showed the chapters as a Saturday matinee.) Its success inspired the action-comedy lampoon series Batman (and its 1966 theatrical feature film spin-off) starring Adam West and Burt Ward. Batman and Robin refers to the partnership between Batman and Robin, two superhero characters originally appearing in DC Comics. The Gotham City Police Department (GCPD) is a fictional police department appearing in American comic books published by DC Comics. The GCPD services Gotham City and is typically depicted in stories featuring the superhero Batman. John Lewis Hart (December 13, 1917 – September 20, 2009), also credited as John Hilton was an American film and television actor. In his early career, Hart appeared mostly in Westerns. Although Hart played mostly minor roles in some fairly well known films, he was probably best known for having replaced Clayton Moore in 1952 in the television series, The Lone Ranger for one season from 1952 until 1953. This is a list of compositions by Mario Castelnuovo-Tedesco. The Mercury Eight is an automobile that was marketed by the Mercury division of Ford between 1939 and 1951. The debut model line of the Mercury division, Ford slotted the full-size Mercury Eight between the Ford Deluxe (later Custom) model lines and the Lincoln. In total, Ford assembled three generations of the Eight (before and after World War II). During its production, the Eight offered a full range of body styles, including coupes, sedans, convertibles, and station wagons. For its first generation, the Eight was produced with its own body, adapting its own version of a Ford body for its second generation; for the third generation, the Eight shared its body with the Lincoln. For the 1952 model year, Ford expanded its namesake division to three nameplates and Lincoln and Mercury to two each, with Mercury replacing the Eight with Monterey (introduced in 1950 as a trim option), lasting until 1974. Joseph Kenneth Shovlin (June 30, 1902 – April 14, 1974), known as Michael Whalen, was an American actor who starred in B Movies and television, including Son of a Badman and Wee Willie Winkie. Rick Vallin (born Eric Efron, September 24, 1919 – August 31, 1977) was an actor who appeared in more than 150 films between 1938 and 1966. Robert Lowery (born Robert Lowery Hanks, October 17, 1913 – December 26, 1971) was an American motion picture, television, and stage actor who appeared in more than seventy films. Wayne Manor is a fictional American mansion appearing in American comic books published by DC Comics. It is the personal residence of Bruce Wayne, who is also the superhero Batman. The residence is depicted as a large mansion on the outskirts of Gotham City and is maintained by the Wayne family's butler, Alfred Pennyworth. While the earliest stories showed Bruce Wayne buying the house himself, by the 1950s at the latest, retroactive continuity established that the manor had belonged to the Wayne family for several generations. Along with serving as a personal residence, the mansion sits above the Batcave, which Batman uses as his secret headquarters. The vast majority of DC Comics references place Wayne Manor just outside of Gotham City in the state of New Jersey.In the 1960s television series, the narrator refers to the mansion as "stately Wayne Manor". For live-action films, English country house locations in Nottinghamshire, Hertfordshire, and Buckinghamshire, as well as Stevenson Taylor Hall in New York, have been used to depict Wayne Manor.